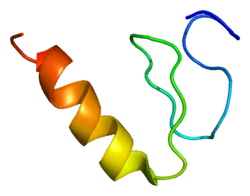 Krüppel-like factor 3 is a protein that in humans is encoded by the KLF3 gene. KLF3, originally termed Basic Krüppel-like Factor (BKLF), was the third member of the Krüppel-like factor family of zinc finger transcription factors to be discovered. Transcription factors in this family bind DNA by virtue of 3 characteristic three C2H2 zinc fingers at their C-termini. Since their DNA-binding domains are highly conserved within the family, all KLF proteins recognize CACCC or CGCCC boxes of the general form NCR CRC CCN, (where N is any base and R is a purine). While the C-termini are similar in different KLFs, the N-termini vary and accordingly different KLFs can either activate or repress transcription or both. KLF3 appears to function predominantly as a repressor of transcription. It turns genes off. It does this by recruiting the C-terminal Binding Protein co-repressors CTBP1 and CTBP2. CtBP docks onto a short motif (residues 61-65) in the N-terminus of KLF3, of the general form Proline - Isoleucine - Aspartate - Leucine - Serine (the PIDLS motif). CtBP in turn recruits histone modifying enzymes to alter chromatin and repress gene expression. KLF3 is expressed highly in the red blood cell or erythroid lineage. Here it is driven by another KLF, Erythroid KLF or KLF1, and its expression increases as erythroid cells mature. Studies in knockout mice reveal a mild anemia in the absence of functional KLF3 and the de-repression of several target genes that contain CACCC boxes in their regulatory regions. Many of these genes are activated by KLF1, hence it appears that KLF3 operates in a negative feedback loop to balance the activating potential of KLF1. KLF3 also regulates another repressive KLF, KLF8. Thus KLF1, KLF3 and KLF8 operate in a tight regulatory network. KLF3 and KLF8 may have redundant functions, as mice lacking both KLF3 and KLF8 show defects that are more severe than in either single knockout. They die in utero around day 14 of gestation. As well as being expressed in erythroid cells, KLF3 is present in other cell types and analysis of the knockout mice has revealed defects affecting adipose tissue and B cells. KLF3 deficient mice have less adipose tissue and indications of metabolic health that may be attributable to de-repression of the adipokine hormone gene adipolin. The role of KLF3 in B lymphocytes is complex but it appears to operate in a network with KLF2 and KLF4 to influence the switch between spleen marginal zone and follicular B cells. ↑ Crossley M (April 1996). "Isolation and Characterization of the cDNA Encoding BKLF/TEF-2, a Major CACCC-Box-Binding Protein in Erythroid Cells and Selected Other Cells" (PDF). Mol. Cell. Biol. 16 (4): 1695–705. PMC 231156 . PMID 8657145. 1 2 3 4 Turner J, Nicholas H, Bishop D, Matthews JM, Crossley M (2003). "The LIM protein FHL3 binds basic Krüppel-like factor/Krüppel-like factor 3 and its co-repressor C-terminal-binding protein 2". J. Biol. Chem. 278 (15): 12786–95. doi:10.1074/jbc.M300587200. PMID 12556451. 1 2 3 Turner J, Crossley M (1998). "Cloning and characterization of mCtBP2, a co-repressor that associates with basic Krüppel-like factor and other mammalian transcriptional regulators". EMBO J. 17 (17): 5129–40. doi:10.1093/emboj/17.17.5129. PMC 1170841 . PMID 9724649. ↑ Funnell AP, Norton LJ, Mak KS, Burdach J, Artuz CM, Twine NA, Wilkins MR, Power CA, Hung TT, Perdomo J, Koh P, Bell-Anderson KS, Orkin SH, Fraser ST, Perkins AC, Pearson RC, Crossley M (August 2012). "The CACCC-binding protein KLF3/BKLF represses a subset of KLF1/EKLF target genes and is required for proper erythroid maturation in vivo". Mol. Cell. Biol. 32 (16): 3281–92. doi:10.1128/MCB.00173-12. PMC 3434552 . PMID 22711990. ↑ Eaton SA, Funnell AP, Sue N, Nicholas H, Pearson RC, Crossley M (August 2008). "A network of Krüppel-like Factors (Klfs). Klf8 is repressed by Klf3 and activated by Klf1 in vivo.". J. Biol. Chem. 283 (40): 26937–47. doi:10.1074/jbc.M804831200. PMC 2556010 . PMID 18687676. ↑ Funnell AP, Mak KS, Twine NA, Pelka GJ, Norton LJ, Radziewic T, Power M, Wilkins MR, Bell-Anderson KS, Fraser ST, Perkins AC, Tam PP, Pearson RC, Crossley M (August 2013). "Generation of Mice Deficient in both KLF3/BKLF and KLF8 Reveals a Genetic Interaction and a Role for These Factors in Embryonic Globin Gene Silencing". Mol. Cell. Biol. 33 (15): 2976–87. doi:10.1128/MCB.00074-13. PMID 23716600. ↑ Sue N, Jack BH, Eaton SA, Pearson RC, Funnell AP, Turner J, Czolij R, Denyer G, Bao S, Molero-Navajas JC, Perkins A, Fujiwara Y, Orkin SH, Bell-Anderson K, Crossley M (Jun 2008). "Targeted disruption of the basic Kruppel-like factor gene (Klf3) reveals a role in adipogenesis". Mol Cell Biol. 28 (12): 3967–78. doi:10.1128/MCB.01942-07. PMC 2423134 . PMID 18391014. ↑ Vu TT, Gatto D, Turner V, Funnell AP, Mak KS, Norton LJ, Kaplan W, Cowley MJ, Agenès F, Kirberg J, Brink R, Pearson RC, Crossley M (November 2011). "Impaired B cell development in the absence of Krüppel-like factor 3". J. Immunol. 187 (10): 5032–42. doi:10.4049/jimmunol.1101450. PMID 22003205. ↑ Bell-Anderson KS, Funnell AP, Williams H, Mat Jusoh H, Scully T, Lim WF, Burdach JG, Mak KS, Knights AJ, Hoy AJ, Nicholas HR, Sainsbury A, Turner N, Pearson RC, Crossley M (April 2013). "Loss of Kruppel-like Factor 3 (KLF3/BKLF) leads to upregulation of the insulin-sensitizing factor adipolin (FAM132A/CTRP12/C1qdc2)". Diabetes. 62 (8): 2728–37. doi:10.2337/db12-1745. PMID 23633521. ↑ Pearson RC, Funnell AP, Crossley M (February 2011). "The mammalian zinc finger transcription factor Krüppel-like factor 3 (KLF3/BKLF)". IUBMB Life. 63 (2): 86–93. doi:10.1002/iub.422. PMID 21360637. Turner J, Crossley M (2000). "Basic Krüppel-like factor functions within a network of interacting haematopoietic transcription factors". Int. J. Biochem. Cell Biol. 31 (10): 1169–74. doi:10.1016/S1357-2725(99)00067-9. PMID 10582345. Wang MJ, Qu XH, Wang LS, Zhai Y, Wu SL, He FC (2003). "cDNA cloning, subcellular localization and tissue expression of a new human Krüppel-like transcription factor: human basic Krüppel-like factor (hBKLF)". Yi Chuan Xue Bao. 30 (1): 1–9. PMID 12812068. Perdomo J, Verger A, Turner J, Crossley M (2005). "Role for SUMO modification in facilitating transcriptional repression by BKLF". Mol. Cell. Biol. 25 (4): 1549–59. doi:10.1128/MCB.25.4.1549-1559.2005. PMC 548027 . PMID 15684403. Kimura K, Wakamatsu A, Suzuki Y, Ota T, Nishikawa T, Yamashita R, Yamamoto J, Sekine M, Tsuritani K, Wakaguri H, Ishii S, Sugiyama T, Saito K, Isono Y, Irie R, Kushida N, Yoneyama T, Otsuka R, Kanda K, Yokoi T, Kondo H, Wagatsuma M, Murakawa K, Ishida S, Ishibashi T, Takahashi-Fujii A, Tanase T, Nagai K, Kikuchi H, Nakai K, Isogai T, Sugano S (2006). "Diversification of transcriptional modulation: large-scale identification and characterization of putative alternative promoters of human genes". Genome Res. 16 (1): 55–65. doi:10.1101/gr.4039406. PMC 1356129 . PMID 16344560.